Considering graduate study at the Melbourne School of Design (MSD)? Join us in Brisbane for a coffee to chat about your study plans. MSD is offering prospective students the opportunity to arrange a time to discuss future study plans via a 30 minute appointment with one of our staff. One-on-one consultations are available on Thursday 13 July. Places are limited; please register to secure a time. 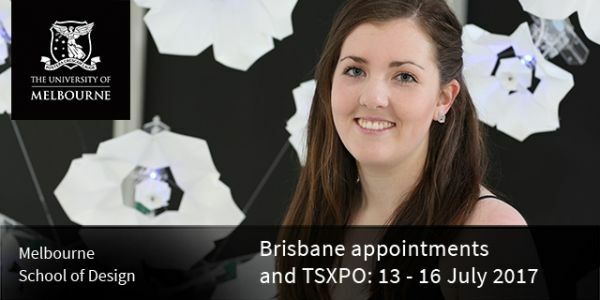 The University of Melbourne is also attending the TSXPO on Saturday 15 and Sunday 16 July. For more details please visit our website.